The byko-drive Automatic Applicator is an economical film applicator that improves the consistency of drawdowns. When more than one operator is drawing down the same coating or ink the dry film appearance will vary because of different drawdown techniques. Drawdown speed and pressure on the applicator tool will impact the result. Film thickness, gloss, opacity, and color can vary with differing drawdown techniques. 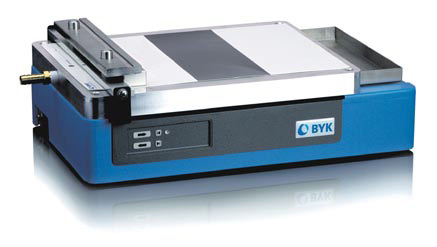 The byko-drive is available with a vacuum plate or glass plate with clamp. Applicator bars, U-shaped bars, applicator frames, film casting knifes, and wire-wound rods are acceptable applicators. The byko-drive has a compact design consisting of a light-weight aluminum chassis and impact resistant thermo-plastic cover. Note: Applicators and Vacuum Pump must be ordered separately.